When a tooth becomes infected, it is usually related to the nerves in the root of the tooth. The infected nerves need to be removed. If left untreated, an infection can turn into an abscess, which is a much more serious problem that includes bone loss in the jaw. The area around the tooth is numbed with a local anesthetic to start the procedure. 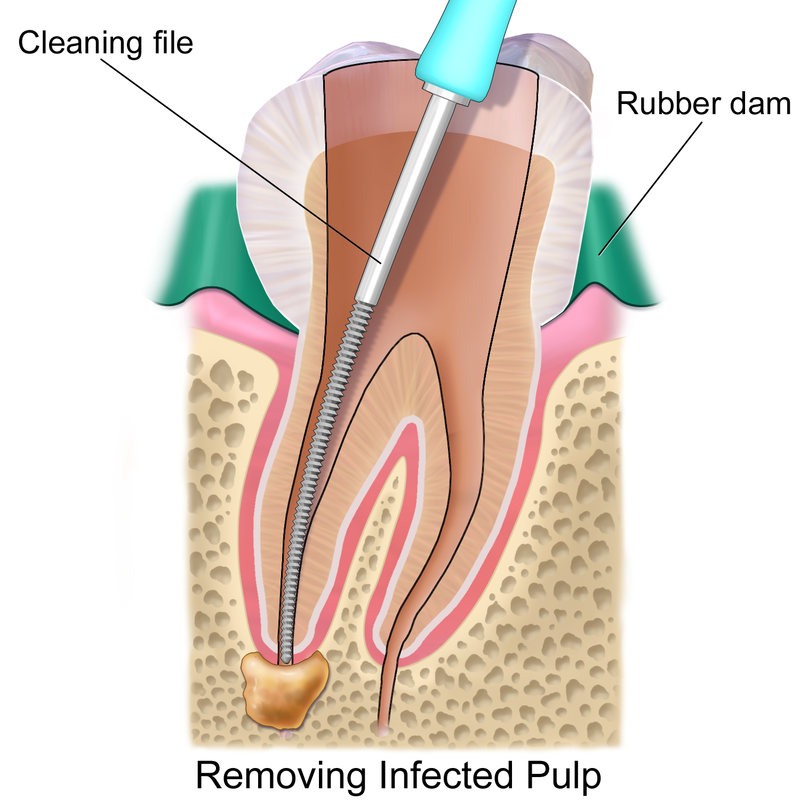 The dentist will then remove infected tissue and clean the canals of the tooth. After the infection has been removed, the space is filled with a sealant called, gutta percha. It is highly recommended that a tooth that has undergone a root canal is fitted with a crown. This will improve the appearance of the tooth, and will also make it much more likely that the root canal is successful. Teeth that have had root canals lose their blood supply, making them more brittle over time. This is why a crown is necessary to protect the tooth from breaking. Sometimes, we can restore even the most broken down teeth with posts, saving you from an extraction. We will evaluate your tooth to help you decide the best course of action for you. "Root canal" has become a scary term for dental patients to hear, but the benefits of the procedure and advances in dental technology have made it much less "scary". Local anesthetics and proper pain medication allow the procedure to be performed with little to no pain in most cases. There may be some slight soreness following the procedure, but that is normal for most dental procedures. The procedure will also relieve you from pain caused by the infection allowing you to enjoy all the foods you love without any pain from heat, cold, or biting too hard. If you are experiencing pain, give us a call today.